As I’m sure you all know, 2012 is a major jubilee year in Britain. Sixty years ago, Ian Fleming wrote the first James Bond novel, Casino Royale. Fifty years ago, the first 007 film, Dr No, was released. And twenty-five years ago, Timothy Dalton made his debut as Bond in The Living Daylights. Dalton had a more serious acting background than the previous Bonds. Sean Connery had played Macbeth on Canadian TV, and Roger Moore had briefly attended the Royal Academy of Dramatic Art. But Dalton, in addition to training at RADA, had extensive theatre experience including the Royal Shakespeare Company; he’d made a prestigious film debut in the The Lion in Winter opposite Katharine Hepburn, Peter O’Toole and Anthony Hopkins; and his TV roles included literary heavyweights like Heathcliff and Mr. Rochester in Jane Eyre. A tapped r is also quite common in Wales, so Dalton’s tap might conceivably be associated with his having been born in Colwyn Bay on the North Welsh coast. 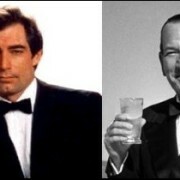 (Until Daniel Craig became Bond, a nice trivia question could be constructed on the different nationalities of all the Bonds: Connery Scots, Lazenby Australian, Moore English, Dalton Welsh, Brosnan Irish; New Zealander Sam Neill was almost cast, which would have added another.) However, according to Wikipedia, neither of Dalton’s parents was Welsh and before he was four the family moved to Belper, Derbyshire, where he grew up. So his real accent background is less Welsh than north/midlands of England, of which the tap is not so typical. A variety of r known as “semi-rolled”, by which we mean rolled, but formed by one single tap of the tongue (narrow phonetic symbol [ɾ]) is used by many Southern English speakers between two vowels, as in arrive əˈraiv, period ˈpiəriəd, but this pronunciation is not essential; the use of [ɹ] is equally correct. The stereotypical view of the British from abroad has tended to be based on the old upper class, and this gave rise to the American phrase veddy British, veddy being an American orthographic rendition of very with a tap. The use of tapped r in the more prestigious forms of British English has declined almost to vanishing point over the past century, but it seems to have lasted longer on the stage. The tap may have been cultivated out of a belief that it “projects” better than an approximant, or even from the longstanding notion that Italian represents an ideal for vocal production. (Taps, and trills, still persist in the singing of English in classical music.) And from a sound-symbolic point of view, an abrupt strike of the tongue to the alveolar ridge is probably more dramatic than a smooth approximation with little or no contact. When I was young, the tapped r was widely associated with one individual above all others: Noel Coward. Coward (pictured above, next to Dalton) is less of a household name now than he used to be. He was very roughly a Stephen Fry of his day, though even more accomplished: a multi-talented (and gay) writer-actor-wit whose image as a performer was a posh, old-fashioned stereotype of Englishness. His output included iconic dramas of English stoicism like the film Brief Encounter, musicals (he composed too) and comic songs like Mad Dogs and Englishmen. We can plausibly attribute those unmasked plosives on it and and to the character’s calculating manipulativeness. But with high-level non-natives who want to sound more native, that’s a kind of pronunciation I try to reduce. My guess is that Dalton’s “underlying” northern accent essentially lacks BATH-broadening, and that he’s adopted it for his work – perhaps decreasingly so as time goes by and the gravitational pull of old RP weakens. 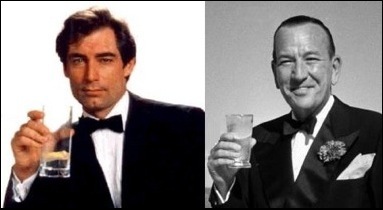 Although the North American producers of the 007 films have always been careful to keep Bond British, they’ve also generally avoided the decidedly posh Englishness of Fleming’s hero in the books. I think it’s no accident that they’ve cast so many non-English actors – keeping him slightly international, and socially more vague than the old RP stereotype of a Noel Coward. Timothy Dalton’s particular mixture of theatrical features with less conservative ones makes him sound somehow classy but classless, and rather mysterious. I certainly think that his speech contributed to his status as the most Byronic of the Bonds. Another rich cocktail which’ll takes hours to digest. One can only say thanks again. I agree with you on [oʊ] for GOAT. If I were not paying attention to this vowel, such a pronunciation would not stand out to my ears. The Queen has something like [ɛʊ]. This is what sticks out as an old-fashioned pronunciation. As an EFL student, I quite enjoy reading your blog. I’ve learnt quite a lot so far. I like how you disprove lots of misconceptions well established in EFL teaching, thanks to the somewhat misleading standard transcription of RP. But have you considered making your postings less extensive and more frequent? You seem to include a variety of topics in every blog entry, which makes them a bit lengthy. Once I get round to reading a post, I eagerly wait for the next for weeks. Don’t you think that more continuity and concision would raise the number of followers? Just a minor constructive criticism anyway. Thanks for teaching! Thanks for commenting – especially if you mean “quite enjoy” in the more flattering sense! No doubt you’re right about extensiveness, frequency and audience numbers. One of my main objectives in the longer posts has been to provide reference material for my students, since the published descriptions tend to be so conservative. Which play is the third Laurence Olivier clip from? Thank you, yes, I’ve managed to figure it out. He sounds majestic, I just love the theatrical polishedness of his speech. I am trying to figure out what exactly is Laurence Olivier saying instead of Talbot, but I just cannot. Perhaps a tiny tip?